[Case Study] Is Getting Stronger Really Your #1 Priority? 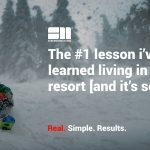 Recently after a day’s skiing and over a good cup of French coffee, I had a fascinating conversation with a good friend of mine about training and his training goals. His short-term goals were to improve his bench press and deadlift to achieve a specific target in order to pass a noteworthy training certification. His numbers had been mathematically calculated, and he was following the program to the letter. However, in the days leading up to this conversation, we had talked about many other things—notably, his current lifestyle, how he thinks he needs to lose 20 lbs, how he’s not sleeping properly, and the significant stress he was under because of work. This tends to be one of our typical weekly conversations with our clients, all over the world. In today’s article, I’m going to share with you a recent case study explaining why strength training may not be your #1 priority right now and what you can do to determine what is. Do We Have an Unhealthy Obsession with Strength Training? 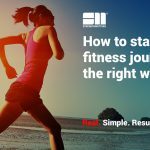 Here at Strength Matters, we talk about health first, and the need for balanced fitness, second. In order to achieve balanced fitness, there needs to be a healthy strength training aspect. Strength really does matter, and we’re big proponents of it. However, in the last thirty years or so, the mainstream media has been ever-increasingly obsessed with strength above all else. It started with the bodybuilding heyday of the 60s and 70s with Arnold Schwarzenegger and continues with the powerlifting and CrossFit craze we see today. These crazes have put strength training firmly in the public eye, which is wonderful to see. There are many benefits to strength training. Not only do people become more athletic when lifting weights but their confidence skyrockets and they have an enormous feeling of empowerment and accomplishment. Sometimes there is nothing more satisfying than picking up something heavy and putting it back down with a thud. As strength training awareness among men and women is on the increase, however, so are the levels of obesity and heart disease. On a near daily basis, we speak to people over thirty who are more concerned about the numbers they can lift off the ground than they are with their risk of stroke, heart disease, and diabetes. Dr. Michael Miller is a cardiology professor at the University of Maryland School of Medicine, and he says the main factors driving the rise in heart disease are obesity and type 2 diabetes. Moving less and stressing more? Does strength training actually get us moving more and stressing less? Think about It. Most people stand in one place, pick something up, set it down, and repeat. What about the stress levels being imposed on the body with heavy weights? I want you to let that sit in and think about it for a little while. As more and more people continue to strength train, obesity levels rise and so does the death rate from heart disease. No matter who you are or your level of fitness, every single person who comes to work with Strength Matters starts the same way. They go through our basic health assessment first. In our initial conversations, most say something along the lines of “I want to increase my deadlift or squat,” even though they already post good numbers. However, the health assessments can be a rude awakening. People get so focused on strength gains that their general health gets left by the wayside. We see this time and time again. This is a pretty standard reading we’re seeing across the board these days, particularly for people over the age of 30 who sometimes have years of just “powerlifting” experience behind them. Looking at the numbers above, do you think his #1 goal should be to get stronger on the deadlift? We sent him to the Doctor to get his blood pressure measured. It came back 160/90. If you’re not sure what that means, if your blood pressure is between 140/90 and 160/100, you have hypertension stage 1. If your blood pressure is above 160/100, then you have more severe hypertension, and you are much more at risk of cardiovascular disease, heart failure, stroke, and kidney disease. The conversation we had with him on hearing these results was very different from the initial conversation we had about him wanting to increase his deadlift as a primary goal. Our focus had become all about his personal health. He had no idea this was the case. He thought that because he was lifting weights regularly, he was fit and healthy. It didn’t even occur to him to measure any of these numbers. He isn’t the first case that we’ve seen like this, and he probably won’t be the last. When people come to us asking for advice or are new clients, there’s a reason we put them through these health assessments firsts. That reason is to establish the truth. And the truth can sometimes be very, very scary. After learning his blood pressure results, we jumped on a call and discussed all of his health assessments in detail. At this point, we hadn’t done any movement screening or strength assessments. We were too concerned about his general state of health. In medical terms, Client X was obese. It was irrelevant how strong he was. He had 34% body fat and a waist/height ratio of 0.67. For men, anything over 30% body fat and a waist/height ratio over 0.63 is considered obese. This is not about fat shaming or being “ripped.” This is about health and longevity. High blood pressure kills. It’s a fact. Client X was unaware of these health risks. He assumed he was healthy because he lifted four times a week. He thought all he had to do was strength train to stay healthy. This mindset is becoming increasingly common these days. Strength training is important, but it needs to be a part of a well-balanced program that incorporates all aspects of fitness. He had been severely lacking any cardiovascular work for a large period of time. And when we talk about cardio, we don’t mean pounding the pavement for long periods of time. We’re talking about basic walking. Client X had been following a standard 5 x 5 protocol for a number of years, focusing on the main lifts, bench, squat, and deadlift, with accessory lifts as and when he chooses. High tension, heavyweights. Here’s what we did instead. WWS: The Secret Weight Loss Formula So Simple, You Don’t Do It. We looked beyond his training and made walking daily a priority. We wanted to take his average daily steps to 5,000. We focused intently on this and held him accountable every day. Over 60 days, we graduated from just over 4,000 steps to 7,500 as a daily average. Water wasn’t monitored during these 60 days as he hadn’t progressed to 10,000 steps; likewise, sleep wasn’t the priority either. However, Client X had become more mindful about his sleep habits, which he was now tracking on his FitBit. By just being more aware of the situation, he increased his sleep average to 6.5 hours. He was already training four times a week for 60 minutes a session. We completely changed the style of his workouts. We reduced the intensity of the weight training and incorporated more mixed modal work. We focused intently on developing his aerobic energy system. In short, Client X had a weak heart, the most important muscle in the body, and it was under-trained. To help him reduce his blood pressure and the likelihood of having a heart attack or stroke, we needed to go aerobic. We train the aerobic system two ways: cyclical or mix modal training. The first is based on running, rowing, cycling, or swimming for pure aerobic work in the domain of 20-90 or minutes. Mixed modal is training the aerobic system with multiple disciplines, combining cyclical work with bodyweight and a form of weightlifting. In the past decade, cardiovascular training has been sold to the lifting community as a way to destroy all your hard-earned gains, get hurt, and get fat. Client X truly bought into this notion, as do many others. But the truth is very different. Cardiovascular and aerobic training offers some serious advantages for weightlifters, and you will almost always see improved performance in the weight room. The better an athlete is at clearing waste and utilizing energy, the longer the athlete will be able to perform at a high level. Aerobic exercise is necessary to make this happen. Furthermore, aerobic training develops a more powerful heart. Consistent aerobic training enables the heart to grow. This means that with each heartbeat, the heart can pump more blood since the left ventricle can fill with more blood. This is a major benefit during exercise because increased blood flow means increased nutrient and oxygen delivery to the muscles. If your heart can deliver more blood with less work, your performance and recovery will benefit. The quality of your recovery can have big implications on your strength results. The notion that aerobic training only benefits endurance activities is fundamentally wrong. A stronger heart and superior circulation result in more oxygen and nutrients provided to working muscles, regardless of the type of training being done. An athlete with superior aerobic conditioning will remove lactate faster, make better use of existing glycogen to fuel their training, and maintain better energy levels and improve recovery times between sets. This means training sessions can include more productive, high-quality work in the same amount of time. But how did this apply to Client X’s four training sessions per week? Workout A was cyclical aerobic work, which included full bodyweight exercises. Workout B was mixed modal work, which included one piece of cyclical work, one full bodyweight exercise, and one form of weightlifting. But here’s the secret … we didn’t make the intensity of these workouts above 70%. For the sake of his blood pressure, we kept all workouts at a 70% max effort intensity. No HIIT, no heavyweights, no high intensity. Just a 70% consistent effort. And here’s what happened after 60 days. Blood Pressure: 160/90 to 120/80. Still some way to go, but significant progress none the less. I share this story with you to help you become more mindful of your own personal health. Health is very different to fitness, and it needs to be considered the number one priority in all training sessions for everyday athletes over the age of 30. We are culturally obsessed with strength training. It can be a wonderful AND detrimental thing if it’s the only thing you prioritize. Strength training needs to be part of a balanced fitness program. You need to learn to train your heart. It’s the most important muscle in the body, and if you neglect it, it has serious consequences. Health is more than just sets and reps, or how much you can lift. Sometimes it just comes down to the basics of walking, drinking water, and sleeping. 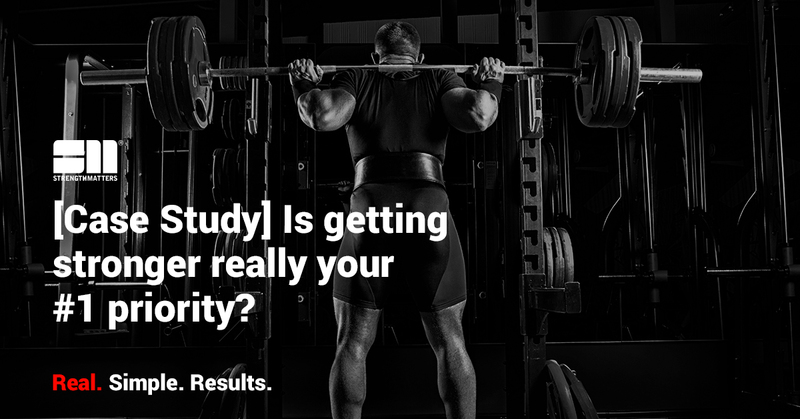 Now that you’ve read this case study, I ask you: Is strength training really your #1 priority right now? When was the last time you took note of your body fat or resting heart rate? Or your blood pressure for that matter? I highly recommend doing the Strength Matters health assessments to find out your level of health. It may just surprise you. In every great movie, the hero embarks on a path that promises adventure, challenges, and finally, achievement. Often, the hero finds a guide that takes the hero under their wing and pushes him or her to the limit. Just think, where would Luke be without Yoda? We are the stars of our own movies. And we all need that guide. When it comes to fitness, a coach can be your guide to movie hero-type success, and your secret weapon. There are so many benefits to having a personal coach. I would go so far as to say that coaching is a prerequisite for achievement. Period. Applying the Strength Matters System to achieve a pain-free athletic lifestyle won’t be easy but it’s guaranteed to work if you follow it. And we’re here to guide you every step of the way. Apply to take our six-week challenge today. Fischer K. Heart Disease: Why It’s Increasing in the United States. Medical News Today. https://www.healthline.com/health-news/why-is-heart-disease-on-the-rise#2. Read A. The A Game . readpt.com. https://www.readpt.com/the-a-game/. Published January 6, 2019. Accessed January 27, 2019.